Join the Evolved Enterprise mission to change the way business is played. 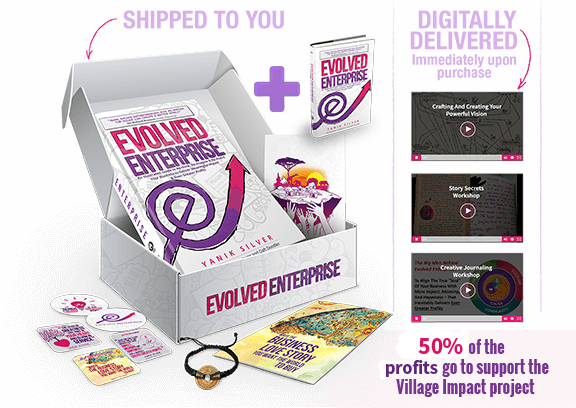 Reserve one of these limited-edition Evolved Enterprise Village Visionary packages, which include two (2) copies of the new hardcover book, bonus material, and special gifts. I am just getting started. I got a possible idea for a new business or I’m really passionate about making the world better and want to see how to turn this into a potential business. I am a seasoned entrepreneur but ready for a change. I feel like I’ve outgrown my business or I want to fall back in love with my business. I’m ready to liberate my greatest work in the world without losing everything I’ve already built. I am already running my business and am totally committed. I want to work on taking it the next level and accelerating everything I’m doing with the Evolved Enterprise model. I’m going to ask you to suspend disbelief for just one moment. Just be open to what I’m going to share with you because on the surface this appears to be way too good to be true. 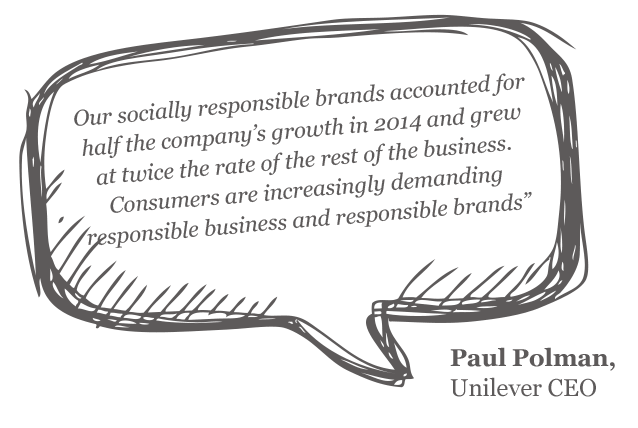 It’s the idea that your business could actually make more profits while making a real impact. I know because when I finally figured this out (the hard way), we ended up with a 823% profit jump over a 3-year period. Have You Ever Been Secretly Jealous of Upstarts LIKE TOMS or Warby Parker? I mean, these companies have come out of nowhere and cracked the code for making a real difference, recruiting & keeping “A-players,” developing ultra loyal customers, scaling quickly, and growing profits -- all seemingly effortlessly. It’s no wonder they’ve also become media & PR darlings, which only fuels their growth even more. Sounds pretty darn terrific, right? These positive changes are practically inevitable when you start applying this Evolved Enterprise™ framework I’ve discovered and apply it to a new business idea or to accelerate your current venture. In fact, my promise to you is if you keep reading, I’ll share with you the secrets to their success and how you can tap into the same seismic shift that’s changing the rules of business forever. The story of TOMS started when the founder, Blake Mycocskie, had a flash of an idea on a polo trip to Argentina. He would sell shoes and give a pair away to a child in need somewhere else. The last time I talked to Blake, he told me they had given away 35,000,000 pairs of shoes. (That also means they’ve profitably sold 35,000,000 pairs. We call this an Impact Scoreboard and that’s just one of the concepts.) And now their buy one-give one model has grown to include other products beyond shoes. Forbes has confirmed their valuation at $625 million with Bain Capital recently buying a 50% stake in the company. Not bad for a guy who only started selling his canvas espadrilles a few years ago. 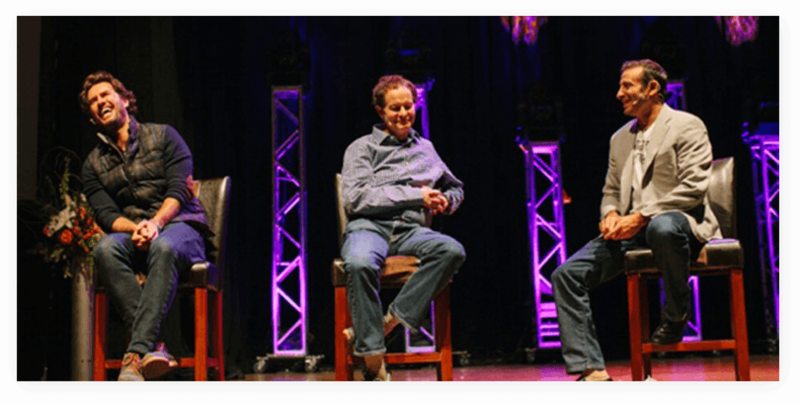 Blake Mycoskie, and Whole Foods Co-CEO, John Mackey, discussing how business can truly be a multiplier for good in the world (and which of them prefer almond butter over peanut butter). Who in their right mind would go after a market where one major player had a 60-80% of the market in the U.S. alone? If you’re eyewear company Warby Parker, that’s a recipe for disruption. Warby Parker was founded in 2010 by four friends -- Neil Blumenthal, Dave Gilboa, Andy Hunt, and Jeff Raider -- who met at business school. 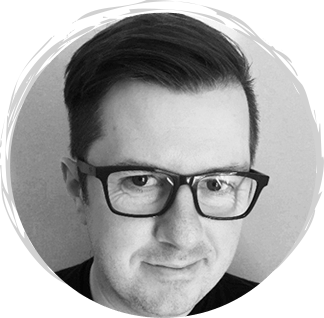 By circumventing traditional channels, bypassing retail, designing glasses in house, and engaging with customers directly, they were able to provide eyewear at a fraction of the going price. And when they combined that with a partnership with non-profits like VisionSpring to ensure that for every pair of glasses sold, a pair is distributed to someone in need, it was a big-time winning combination. The launch was so successful that the team hit their first year sales targets in the first three weeks. Today, less than a few years later, according to the Wall Street Journal the company is valued at over $1 Billion from a recent investment they took in. The Evolved Enterprise is an illuminating journey for 21st century entrepreneurs ready to explore how greater purpose, joy, and meaningful impact create fierce brand loyalty and marketplace leadership and deliver exceptional profits. You could catalyze a community of raving fans who eagerly wanted to spread and share your brand. You could SCALE faster by empowering your team around a greater mission. You could have high-leverage distribution partners, media and even celebrity endorsers approach you. You could attract and keep real “A-Players”. You could deliver a true impact (not just ‘giving back’) that built a legitimate competitive advantage. Not only can these concepts drive your bottom line, they actually create a sustainable competitive advantage, re-igniting everything you do with more joy, happiness and meaning to fulfill a higher mission. Research continues to show that this is not just a trend but a serious seismic shift. It confirms what you might have felt in your heart already but now the data is backing it up. It is VERY possible to do good in the world and do well for yourself and your company all at the same time. From 1998 - 2013, the cumulative returns of Evolved Enterprise eclipsed the S&P500 by 1400%. That’s a 14 to 1 difference! Easy. It’s going on from the outside in with customer buying criteria changing and from the inside out with employees. Plus, the largest living segment of our economy, millennials, represent $2.45 trillion in spending power and is 60% more likely to engage with brands that discuss and act on social causes, according to Cone Communications. Employment surveys show that millennials are willing to get paid less to work for a company that has a core mission or purpose to what they do. 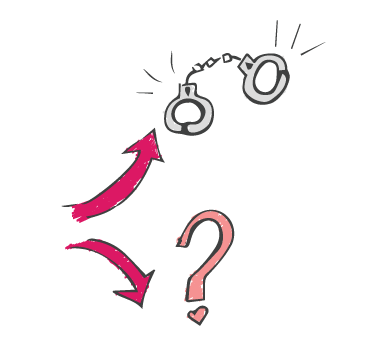 Recent Gallup polling reveals that 70% to 87% of employees are either not engaged or actively and deliberately disengaged (meaning they wish to do harm to your business). This all changes with a team aligned to a worthy mission! I want to hand you the greatest competitive advantage available to you right now for just about any business or someone just starting out with a big dream in front of them. However, I must warn you this is not some “flavor-of-the-month” tactic to sprinkle into your venture. It has to come from a genuine, authentic desire to make a greater impact in the world. Otherwise, applying the Evolved Enterprise framework will only fast forward your demise because of greater transparency and scrutiny. If you’re with me, I’m going to show you exactly how to re-think, re-imagine and, most importantly, re-invent your business to deliver meaningful impact, deeper fulfillment, and even greater profits. This is the new model I discovered - the hard way - that changed everything. And I’m hoping I will make such a compelling argument that you’ll want to pay more than double the price of what the Evolved Enterprise book is priced at in bookstores or online to reserve a limited-edition, autographed copy and special bonus package going to help fund an entire village of micro-entrepreneurs in East Africa. More on that in a little bit. Before that though, it might be helpful to get some of the “background story” so everything jumps into a clear focus. Let’s start from the beginning. I promise, it will all be worth it for you in the end. I had my family to think about, and all my partners, as well as a working “marketing machine” that just kept ticking along. From the outside, most people would think I had achieved total success. I was making a LOT of money online by truly helping people. I had built up a great reputation in the marketplace, drove a super cool car, had an incredible family, lived in a nice neighborhood, etc. Maybe you’ve experienced the same thing…. Perhaps you’ve already “made it” but realize there’s something more. You have a nagging notion you can’t shake that you were designed for greater things. You want to fully commit ALL your talents, passion, and resources into something bigger. Maybe you discount this as burnout, but you KNOW it’s much bigger than that. I’ve come across so many entrepreneurs who feel this way. Of course, you could continue to plug away, but you know in your heart that will just slowly eat away at your soul. You need to make a leap into the next chapter but aren’t sure you can without sacrificing everything you’ve worked for. And that lack of enthusiasm carries over to your team, your work, and your customers. Truly everything. You’re going to subconsciously sabotage either your business, your job, or your life to make it change unless you’re aware of what’s going on. That’s when you go looking for creative (and sometimes self-destructive) outlets to compensate for not being totally engaged. Following your true heart’s calling is never wrong—but frequently scary! I know because I’ve been there. I knew my greatest contribution lay somewhere else with everything so far being the set-up for something greater. I had stopped growing and stopped being passionate about what I was doing. These frustrations led me to do a lot of journaling and reflection. 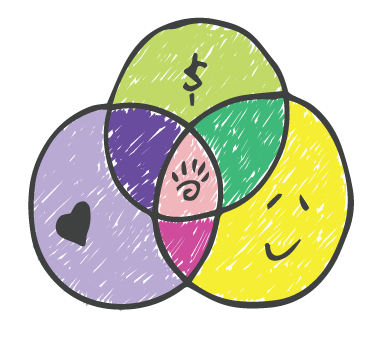 My discovery was that I was happiest when I was actively engaged in three areas. As shortcuts, I called them make more, have more fun, and give more. Interestingly enough, I found that each of these areas affected the others. For example, the more fun I had, the more my income might go up; or the more I gave, the more income I’d create, etc. Originally, my idea stemmed from my own desire to hang out with other successful entrepreneurs and do wild adventures together. I’d combine it with business building and something charitable mixed in. I called the company Maverick Business Adventures®, with the advantageous acronym of MBA. Maverick Business Adventures began to take on a life of it’s own. The trips were epic affairs with incredible attendees, and we were making good memories traveling the world. However from a financial standpoint, we were going the wrong direction. I was at my kitchen table about to eat breakfast, going over the things I had to do that day in my head. There were over $70,000 in bills weighing on me, and at that point, I really had no smart way to pay them at the moment. I could feel the tension of my higher self at war with the guy who had a business to run, and commitments to keep. My new enterprise was failing financially, I was only playing halfway with it -- and it was bleeding money fast. By way of background, I’ve had eight different products and services that hit the cumulative seven-figure mark in the online space—so I knew a thing or two about what works—but the playbook had changed for me. I mean, how the hell could I not fix this? I pretty much had the Midas touch with all my business ventures before. But now, something I cared so deeply and passionately about was going south…and dragging my other businesses down along with it. 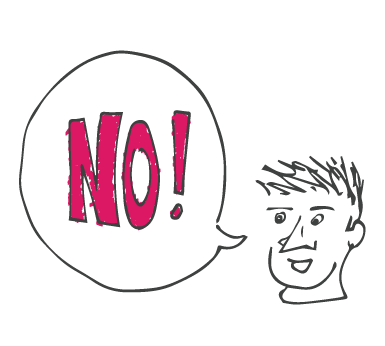 The shock and anger was all I needed to take action and make a giant change in my business. I realized my “Big Why” was not to build out an adventure travel company but to truly change the way business is played. Looking back at this experience, I’m actually incredibly grateful for not getting it “right” the first go around. I’m thankful for those experiences because it forced me to truly decide if the vision for what we were building was worth it or not. If I was just creating a fun adventure company, then, no, it wasn’t worth it. It was my love for a bigger mission that kept me going to figure out how to make it work. I decided right then at that time that I couldn't face my children another moment if their father wasn't doing his absolute best to help change the world. I believe business can be the greatest leverage to make that difference, and I knew we could have a hand in that kind of important work. I felt like a HUGE weight had been lifted off my shoulders..
Changing the name of the group to be called Maverick1000 to more accurately reflect the evolution of bringing together 1,000 game-changing entrepreneurs. Creating the bigger “why,” updating our business model, and helping finally drive significant profitability. Connecting and collaborating with the biggest business icons and celebrities, who shared our vision of business and playing a bigger game by these new rules. Contributing over $3,000,000 to cause partners that empower & enable entrepreneurs. 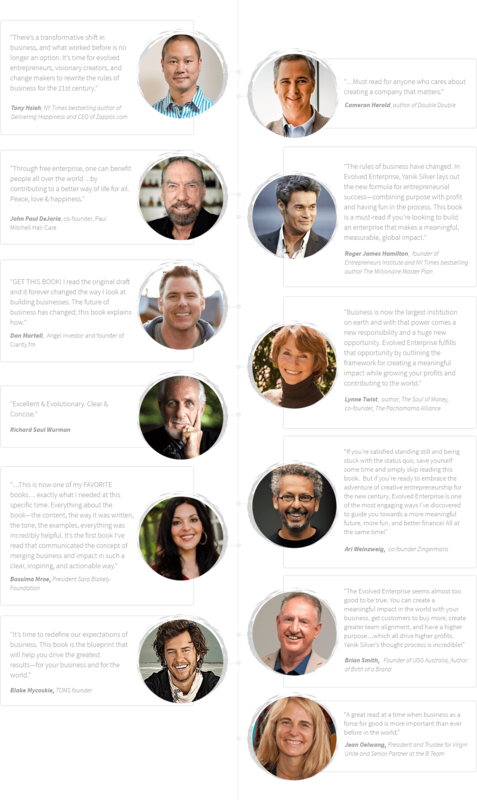 Putting together the “puzzle” and framework of Evolved Enterprise one hard-earned lesson at a time from well-known mentors and relatively “unknown” yet super successful business owners. Looking at our own internal numbers we increased our profits 5X in year one and then nearly doubled again the next year. We ended up with a 823% over a 3-year period growth to be more exact. 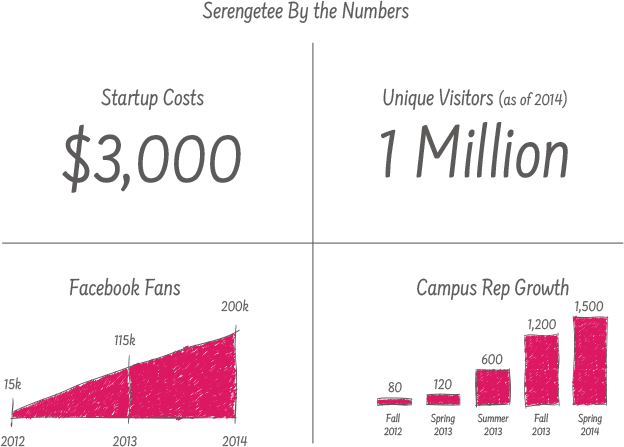 This gigantic leap is only possible because of applying these Evolved Enterprise ideas. Now, from everything I learned and experimented with on our own companies and with Maverick members, I wanted to share it inside a new book I released last year entitled Evolved Enterprise. It was the complete distillation of everything I learned and figured out. I truly poured my full heart and soul into the project. For the first time ever, I put 100% of everything I had into a project. That book was released to media and industry acclaim on Forbes.com as well as a host of other publications, blogs, and other outlets. And Entrprepreneur.com named Evolved Enterprise as #1 of their "4 New Books That Can Change Your Entrepreneurial Life” list. I soon realized the book could be a “seed” planted to share this new operating system. 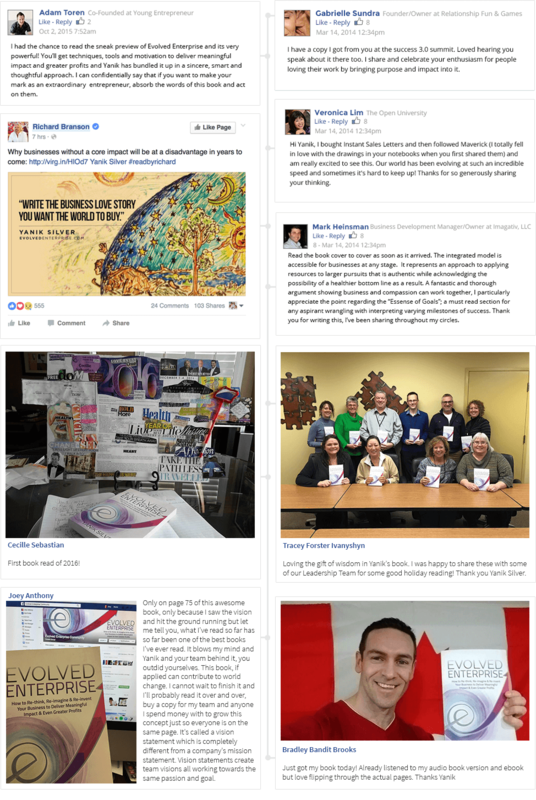 I was filled with a sense of awe at the incredible results the first readers report having as a result of doing authentic good for the people in their marketplace. And that’s why I originally committed to giving away 10,000 copies at my cost. 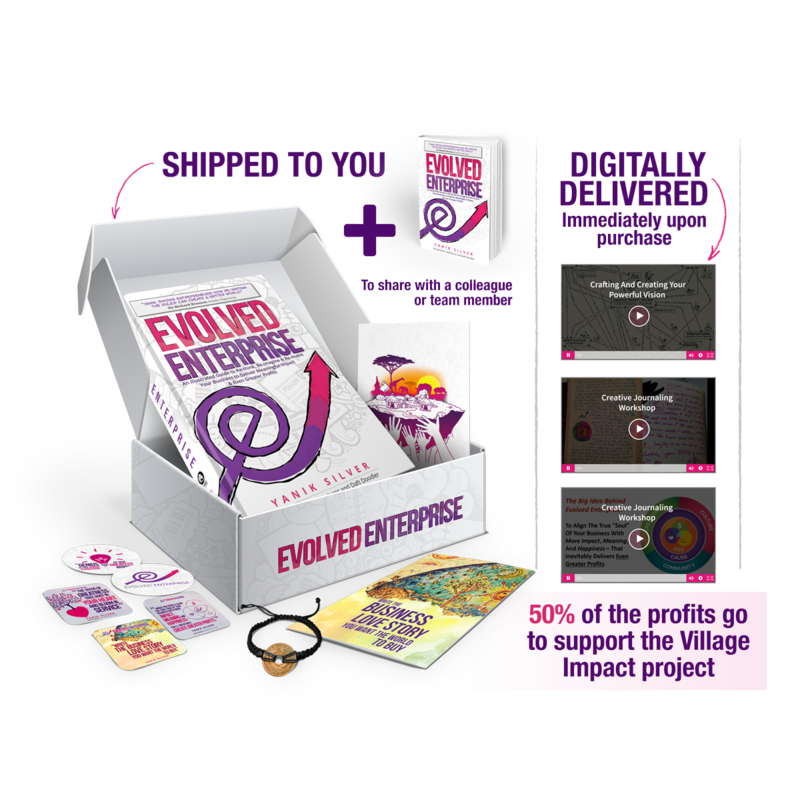 After those flew off the shelves, it became clear after the initial launch of Evolved Enterprise, there would need to be an expanded and updated edition as the concepts were being discovered by a wider audience. A forward-thinking business book publisher and I partnered to make this new, revised edition something truly special. We doubled down on refining, perfecting, and clarifying the concepts to apply to just about any small- or medium-sized business. Well, to be fair, it’s a LOT more than just a book, and what we are doing with a large part of the proceeds could hardly be called just a “deal” but, more accurately, a Limited Edition Set going to support an entire village in East Africa. So here is the “behind the scenes” incident that turned the whole thing upside down (or right side up, if you’re the type of person who would LOVE to make more money, doing true good in the world). One of the “launch elements” we considered, obviously, was the impact we’d have aligned with the book. 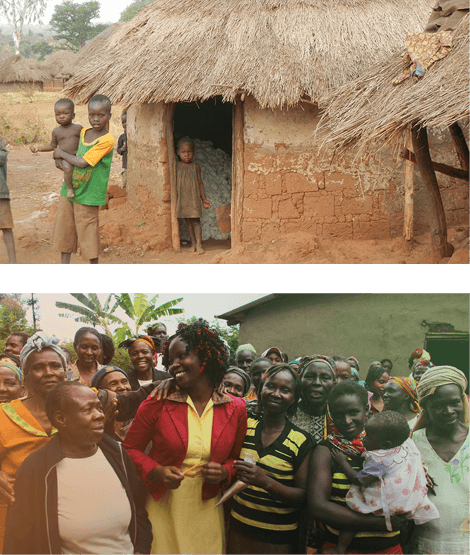 We were going to work with one of our long-term cause partners, Village Enterprise, who works to lift Africans from extreme poverty through entrepreneurism. We had always planned to make a donation toward their work -- but could there be something more? 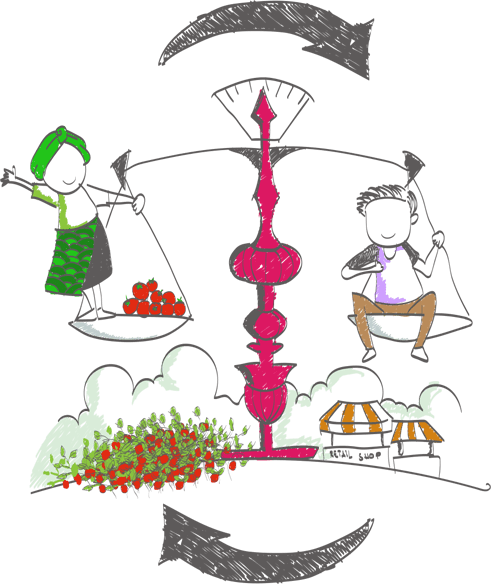 What if we could start not one or even 10 but strategically develop a complete grouping of 50 complementary businesses an entire village would need to prosper? Is that even possible? What would that look it? What if...those businesses were interconnected, creating a network of entrepreneurs who work with and for one another? What if...the initial investment is as simple as a packet of seeds or a few chickens? What if...the return on that investment could be exponential? What if...the impact could be more kids in school, fewer mothers dying in childbirth, and an entire community thriving? I went to my team and even a few high powered friends to gauge their reaction on an idea to fully incorporate Village Enterprise in a much bigger way. The excitement I got back from each and every person I shared my idea with is something I am humbled by and remarkably grateful for. We scrapped all our previous ideas and developed the plans for the Evolved Enterprise Village. It’s a pretty big and audacious goal, but with your support, we will bring this revolutionary vision to life. The enormous potential that lies in creating networks between new entrepreneurs allows them to scale and diversify. Maybe the businesses launched may start as a small plot of tomato plants or a simple retail shop. But that’s just the start because the tomato grower could buy manure from the owner of a livestock business to bolster her yields. Her improved yields and exemplary product could attract the attention of the owner of the shop. Within a few years, you wouldn’t recognize this once poverty stricken village. Lack of opportunity is a thing of the past. Unimaginable potential is on the horizon. 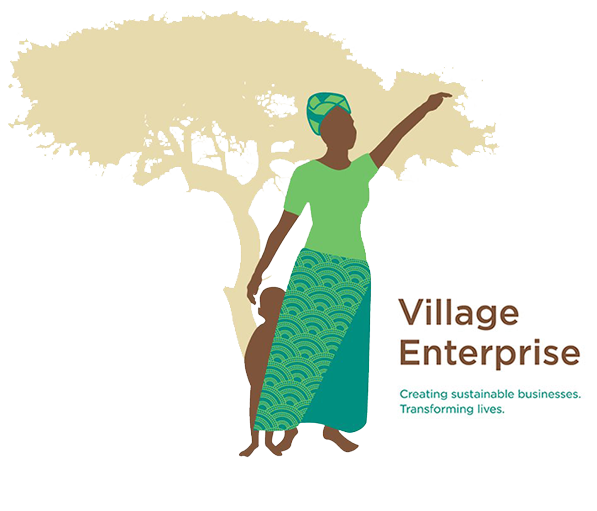 The Evolved Enterprise Village project is in partnership with Village Enterprise to harness the incredible power of entrepreneurship to drive revolutionary and lasting change in a poverty-stricken village in East Africa. 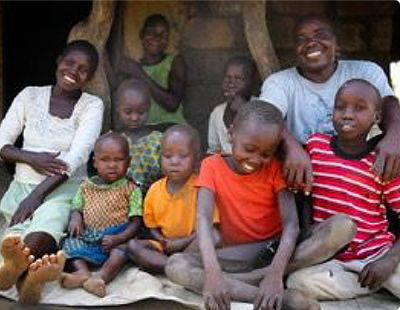 Village Enterprise works with individuals in the most remote and rural parts of East Africa. Most have never attended a formal school. 80% are women. All live below the extreme poverty line of $1.90 a day. Their track record is incredible as they have started over 33,000 businesses and already trained over 136,000 East Africans. That alone makes them an organization I am proud to support. 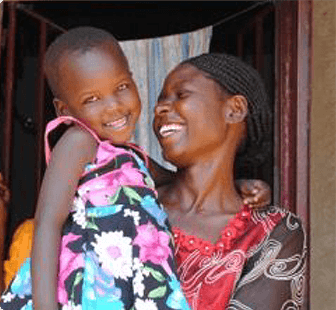 These entrepreneurs are now able to pay school fees and provide solar lights so that their children can dedicate the evening hours to studying. The shopkeeper invests in sanitation facilities for every home in the village. "Village Enterprise came like a key in my life. It is Village Enterprise that really opened my eyes and made me who I am today. It was out of the program that made me hope for the future. Because it is this program that made me realize, I can’t continue to stay like this. I have to change." “Before we were in the group, it was only men who traveled to town to trade. Never women. But now, we stand before the men. We do business with them. We exchange with them! We have truly become empowered women. There is nothing a man can do that a woman cannot also do!" Now, this is the part that I really want you to follow me on. I want us to be in total alignment here. Each new 3-person business costs $500 to start and benefits an average of 20 people. 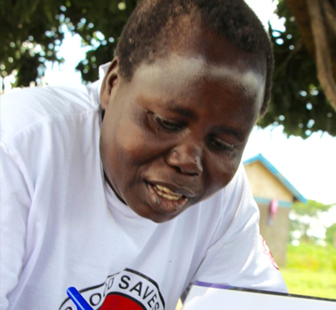 Doing the math means we need $25,000.00 to fund an entire village of 50 micro-enterprises. (That’s 50 x $500.) 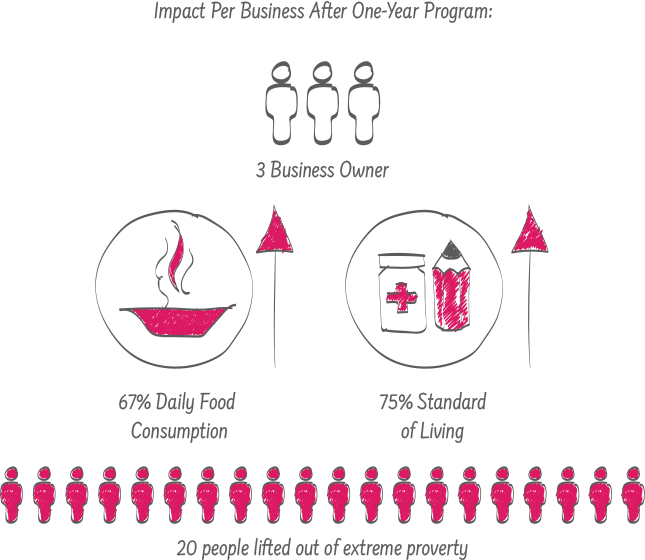 And the impact will be 1,000 people lifted out of extreme poverty (50 businesses x 20 people). 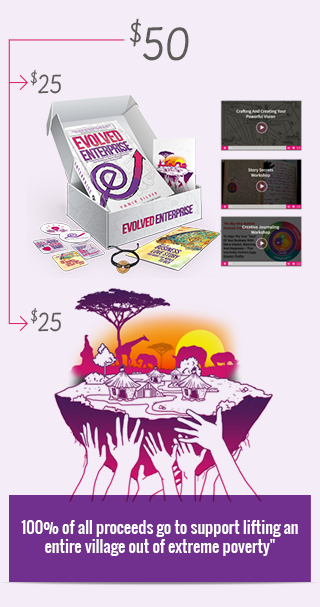 We are making available these Limited Edition Evolved Enterprise Village Visionary packages for this special release of $100 with 50% of the profits from every sale going to fund this project. 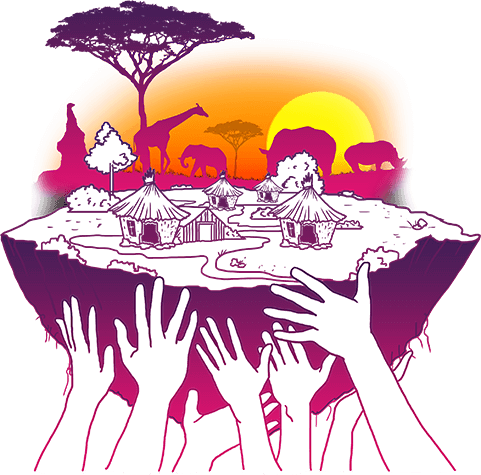 That means for each of the Limited Edition Evolved Village packages you are directly impacting one person and helping lift them out of extreme poverty in East Africa. My Personal Story: How a near ‘business burnout’ was driven to develop the principles of the Evolved Enterprise™ and turn everything around in a way that truly connected my passion, purpose, and profits. The 5 Parts Of An Evolved Enterprise and how all the pieces work together to create an exceptionally impactful AND profitable business. 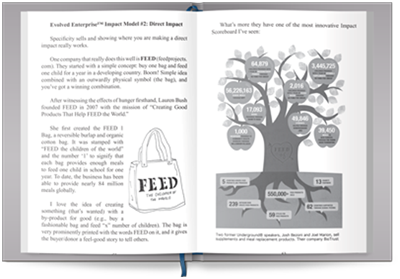 The Evolved Enterprise Impact Models - 11 real world business models companies are using to integrate core impact with high profits and how you can apply the model that works best for YOUR business. How to systematically identify your ‘core purpose drivers’ and transform selling into an expression of love and the highest form of service you can possibly give another person. How To “piggyback” off the reputation and reach of well-known cause partners for instant boosts in credibility, conversion, and coverage. How to create a legion of loyal fans around your company who buy like crazy and love to share your product or service with their friends. Why culture happens whether you create it or not, and how to use language, symbols, images and rituals to manage it in your favor. Dozens of synergistic ways you, your customers, and your partners can do well by doing good… while spinning off marketplace driven abundance, compassion, and value. How to uncover hidden opportunities inside your business to tell your story, establish your unique positioning, grow your profits, and spread your mission. The secret to creating a brand so strong that your product or service becomes an inseparable part of who your customers are. 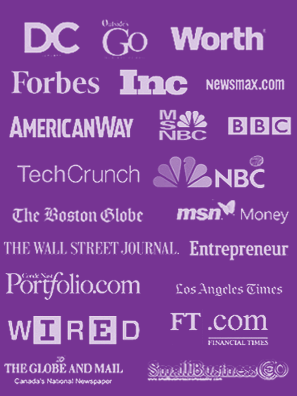 How to leverage the Evolved Enterprise “Halo Effect” to secure major media attention, hard-to-reach partnerships, and massive word-of-mouth marketing, plus much more. The illustrated guide to re-think, re-imagine and re-invent you business to deliver meaningful impact, deeper fulfillment and even greater profits. This is truly biggest competitive advantage you can gain right now. You’ll get solid tips on on how to hone your vision into something that gets people on their feet and excited to take action! The More power in the vision, the more power for the mission. A guided tour of my own personal “Vision for 2020” and it’s creation process. I will walk you through every step we took in order to make it a living breathing thing that people can understand and get excited about. How to engage a powerful Vision to attract and KEEP the absolute best talent in your industry. I have come to learn that sometimes it really is about more than just the money with people who operate at the highest levels in their field. A practical roadmap on engaging and defining your vision to drive down costs in areas of your business like: Customer service, Advertising spend, Team costs, and even content production! How your well crafted vision can help you weather the storm of uncertainty that comes with a new business, and give you (and your team) the strength to rise above almost any challenge. Discover how to tap into your unique origin story to connect with anyone and bond customers and collaborators alike to your ideals, brand, and vision. 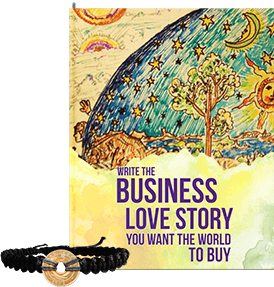 In his special workshop 7 Story Secrets, You will discover how to develop, share, and hone your personal story, as well as the story of your enterprise, it’s people, products, and impact to the world. The 5 secrets to maximize your influence, attract more customers, and spread your impactful message while uncovering the underlying essence of what makes you truly happy and fulfilled and integrating those into a business that you absolutely love. How to get your best ideas out of your head ind into the process of getting built! You will learn several ‘brain tricks’ designed to spur your best insights into effective action. Why the University of Victoria believes that writing in your journal has a positive correlation with actually raising your IQ score! A briefing on several new studies on how journaling has a proven scientific link to building a stronger business that can better weather the modern challenges in the marketplace. Secret ways of tapping into your whole mind and answers from your higher self and much more. The Illustrated BIG Idea journal. Carry this with you to organize your thoughts, jot down inspiration and answer important prompt questions. Watch your big ideas take shape on their way to making a BIG impact on the world! Keep the journal nearby so that you can write in here whenever inspiration strikes. A 100% Authentic bracelet hand crafted by an East African artisan. 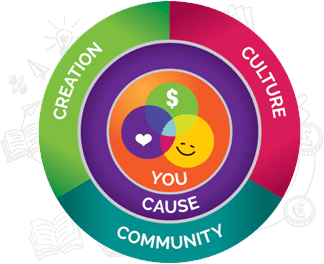 You’ll have a perfect reminder to wear of your commitment to building an Evolved Enterprise and your support of the Village project. East African coins, minted from 1906-1964, during Colonialism, are turned into a unique piece of jewelry. No longer used as currency, today the coins are used when practicing traditional beliefs. Traditional beliefs in Uganda revolve primarily around ancestor worship and these coins are a direct link to the ancestors. It may be the feeling of peace that comes from making a successful living while pursuing your own highest purpose and ideals. Look, I am super excited about this, and I want you to be excited about this too. 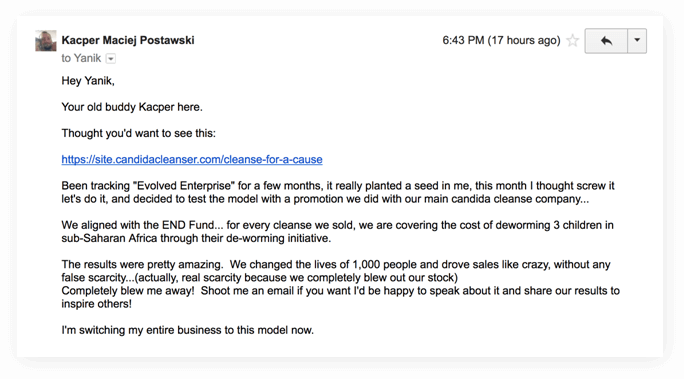 I don’t want you to get this just because it’s a worthwhile cause; I want you to do it because it’s the best possible thing you can do for your business. The Evolved Enterprise journey has had an enormous impact on my life, my family, and my business that’s hard to measure even beyond our increased profits. The feeling of running a business that makes an authentic difference in the world AND earns as solid an income as we do, well, it’s just absolutely frickin’ awesome! I’m not sure how else to put it, and that is also my fondest wish for you as well! …to experience the feeling of knowing that your business is in tune with your life as a whole and operating without the limits many will face when they just aren't doing what they love. This only happens by truly connecting your head (business sense), heart (impact), and “North Star” (higher purpose). If you put the Evolved Enterprise principles to work for you today, it’s hard for me to say which tangible change you will notice first. Living in true alignment with yourself has a way of driving your greatest work to the surface, and as good as it feels for you personally, it’s even better when those close to you on your team, in your family, and your circle of friends all begin to notice it as well. You’ll be more excited to truly put out your most meaningful work. Am I perfect? No, not at all, but I know I’m constantly evolving and growing. 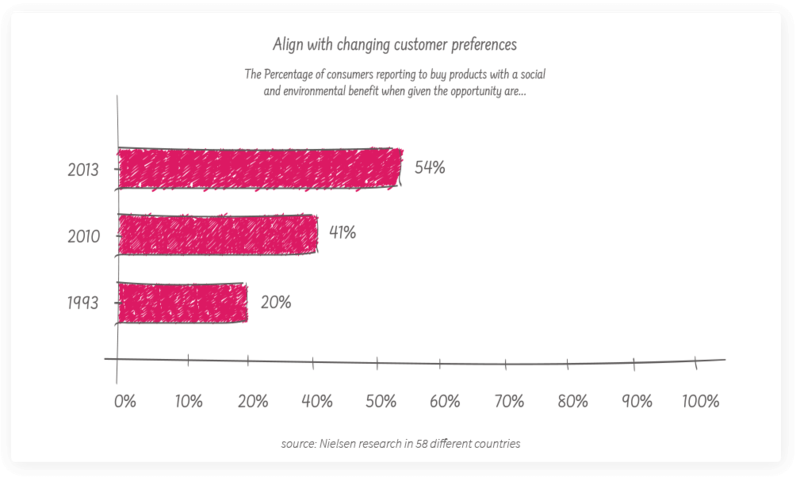 It could show up as more new customers, or a higher customer value initially, or a larger long term customer value. They took a simple idea, condensing the books people wished they had the time to read into 15-minute summaries in video, audio, and text. During the very same month that Steve implemented the Evolved Enterprise principles, his earnings went up a staggering 15x! It was more than just one change, but the centerpiece was a giving element that allowed people to donate a portion of each sale to a charity that mattered to them as an individual. Another benefit of an Evolved Enterprise could also come as better social media engagement, lower customer service costs, or a newfound access to the sorts of partners and deals that only a true mission has a way of attracting. From day one, their mission was at the heart of everything. By purchasing fabric from over 25 countries, they support artisans, their families, and ancient fabric-making traditions. 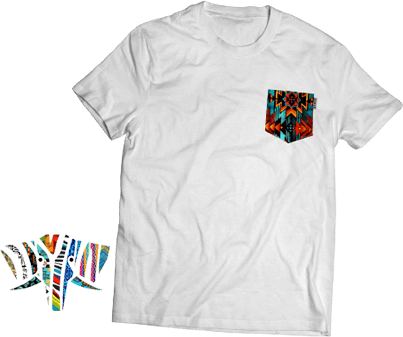 They give 10% of their profits to a diverse range of grassroots causes to improve lives in their communities. Started with just $3,000, the results have been staggering. Now they have over 1 Million visitors in just a few years and hundreds of thousands of Facebook fans generating a multi-million dollar enterprise. And this works because you are not just hawking a product or service but you are getting your customers on board to make a real difference for something that matters, just like these college dropouts, who turned their idea into an eight-figure Evolved Enterprise, will attest. Love Your Mellon was started as a class project by Zachary Quinn and his co-founder, Brian Keller. 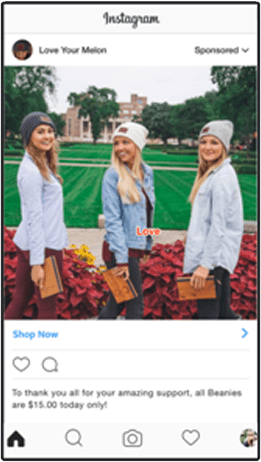 They were sophomores at the University of St. Thomas in St. Paul, Minnesota, in 2012 when they struck upon the idea to sells hats, beanies, and scarves to support kids with cancer. They started with a table out in front of Quinn's parents' restaurant. The response was so great they dropped out of college and only a few years later, the company is doing $21 million in revenue. Plus they take 50% of their profits to help children with cancer, and those donations have totaled over $1.5 million in just 4 years. The best part is you don’t have to do the heavy lifting yourself. Your customers become fans and advocates when you have a deeper purpose. And for a recent promotion they saw a massive return using social media in the neighborhood of 66x on Instagram and 44x on Facebook from their ad spends. What’s more, Love Your Mellon has more than 12,000 student volunteers across the country at 700+ different schools helping with projects and fundraisers and being ambassadors for the brand. The founders, David Heath and Randy Goldberg, saw a news release that stated socks were the No. 1 most requested clothing item at homeless shelters. The two of them took that as a personal challenge to make a difference by building a better sock and to donate one pair to a homeless shelter for every pair sold. That little idea turned into $2 million in sales in just over one year, and it is continuing to grow at an accelerated clip. 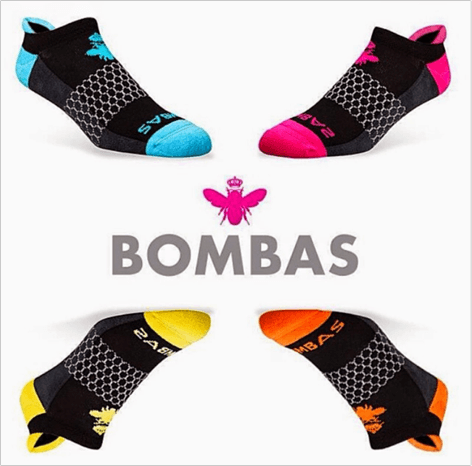 And as Bombas has grown, their culture of impact continues to be baked in. The founders and their staff, which is now up to 15, take one day a month to volunteer at a shelter, at a soup kitchen or with one of their hundreds of giving partners. Farmers typically lose 20% or more of their crops to “ugliness.” People just don’t tend to buy spotted bananas. They now buy over 11 million of the imperfect organic fruits and “upcycle” them as tasty chips. 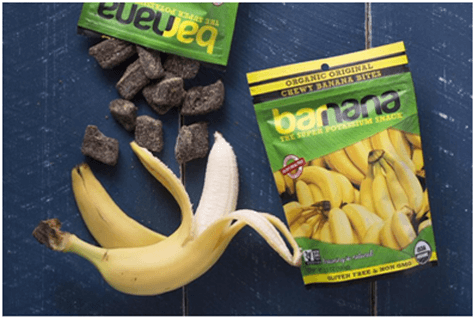 Barnana is now growing at well over 130% annually while making use of a resource otherwise headed for a landfill! In the same spirit, the motive behind Coffee Flour is to make use of the billions of pounds of discarded coffee fruit that is a byproduct of the coffee industry. The result: a tasty, nutritious flour that can be used for baking, cooking, and making beverages. It’s high in fiber, protein, and antioxidants as well as being a non-GMO food that is naturally gluten-free. 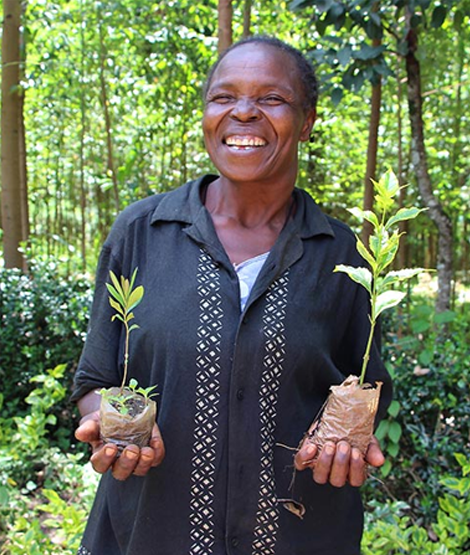 Coffee flour is a perfectly versatile ingredient, and it also helps create jobs for farmers and protects the environment. Listen, all of this is just a snippet from countless examples of how to re-think, re-imagine, and, most importantly, re-invent your business to deliver meaningful impact, deeper fulfillment, and even greater profits. The main takeaway from all the business examples above is that there are a MILLION great ideas out there just waiting to come to life and hundreds of ways to build or grow your business in a way that authentically makes the world a better place. The combination that YOU come up with will be yours alone, and the problems that your business solves for the world will become part of your legacy and greatest work. Let’s do it together by being part of something else really special. Pretty cool, right? 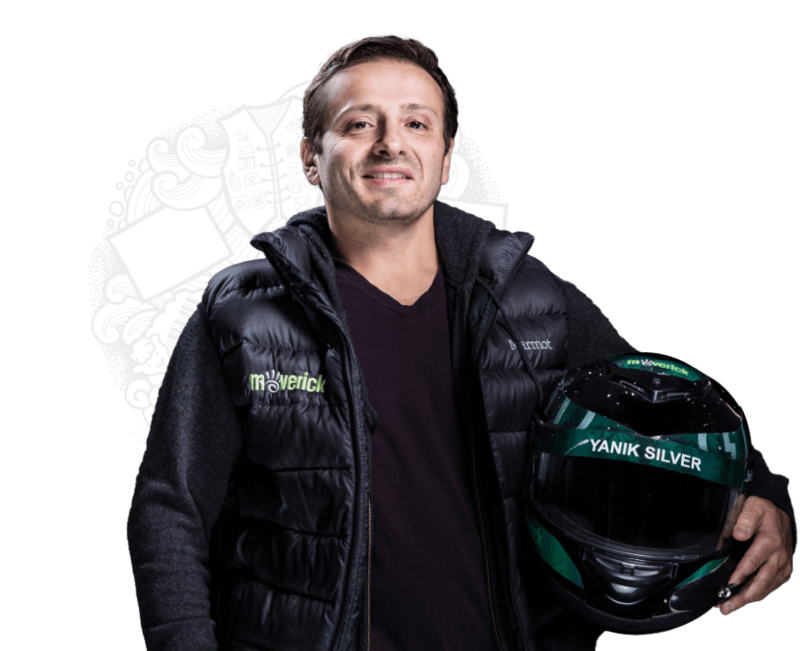 1,000 people had their lives changed from just a small tweak and now he’s got an entire new way of doing business that’s more engaging for everyone involved. That’s why I love this so much. And your purchase and support can be a significant turning point in your business and your life and also help so many others too. 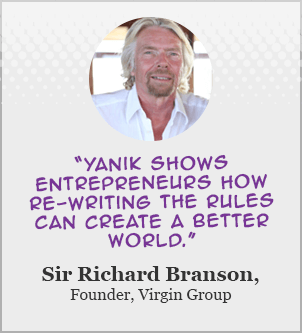 I hope you’ll join us in changing the way business is played!